Lying is a rite of passage for children – they all go through it and test boundaries by trying out various lies. Sometimes, lying has a bigger cause and before you talk about your child lying or hand out a consequence, listen up. You have to get to the root of the lie – understand the type of lie and what led to the lie in the first place. Here you’ll find 8 different types of lies and the rationale behind them so you can see the lie through your child’s perspective. 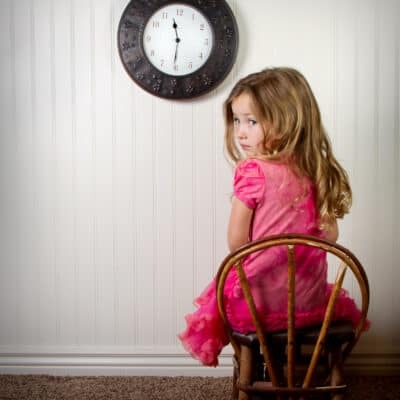 I’ve been catching my two five-year-olds lying a lot and it’s driving me nuts! They’re pretty innocent lies, like my son’s knee-jerk reaction that he didn’t *actually* just push his baby sister, or because my daughter wants a second snack and told me she hadn’t had one yet. So far, they aren’t big lies. And then, something my daughter told me after school opened my eyes to the lying world of little kids. One day at school pick-up, my daughter told me that one of her friends’ parents were arrested over the weekend and were sent to jail. Now the little girl and her brother were living with grandma and grandpa. This was terrible – obviously – and being concerned because this was one of her closest friends at school, I asked the teachers how we could offer our support to the family. The teacher’s eyes practically bugged out of her head and then she started laughing. It turns out the little girl’s parents are a Veterinarian and Lawyer and no one was arrested. EVER. It was all one big fat lie. The little girl’s big-blown up story stuck with me though. Does my daughter create stories like this too? Why do kids create these elaborate stories that just roll off the tongue? How as a parent, do we teach honesty? After doing my research, I discovered that lying is a natural part of child development; to them it’s an easy solution to fix a problem. A lie can point the blame on someone else to get out of being in trouble; to obtain something they want; to avoid doing homework or another disliked task; or to avoid a parent’s disappointment or punishment. Psych Central notes that children’s moral codes are developed over time and from learning right and wrong. Young children don’t understand the difference between fact and fiction. Kids lie to create stories that blur the lines between reality and fantasy before they learn about the importance of honesty. Your child may also be dishonest as a form of trying to understand new ideas. For example, when my husband’s Grandpa died, my son and daughter would role play with their stuffed animals all being dead. Its a bit morbid, but it was a concept they had never learned about to that point. They would tell people stories about their dogs being dead (they weren’t) and talk about people they knew who died (all make believe.) It was simply their way of trying to process the idea of death. It would be ignorant to think that my children will never fabricate stories. I know they will. I just hope the deceit is minor. I want to have an honest relationship with my kids – who doesn’t – and I don’t want them to feel compelled to lie to me, especially as they get older. How can we build trust with our kids and have an honest relationship without endorsing any negative habits of lying? How do we teach the true value of honesty to our children in the stages of their young development? I’ve learned that the home life and parenting habits we have, are the leading contributors to lying. Here are the 8 TYPES OF LIES SCHOOL-AGED CHILDREN TELL. Kids lie to get out of doing something they don’t want to do. For example, these avoidance tactics may include trying to get out of doing homework, chores, walking the dog, picking up their room or helping out. If you ask your son if has finished his writing assignment, he responds with “Yes Mom,” because it’s not something he wants to do and gets you to stop asking him about it. He is lying to avoid the writing task because he doesn’t enjoy writing as some kids might try to skate out of their math or Spanish homework assignments. Children also lie to avoid doing something that is beyond their capabilities, such as a homework assignment they don’t understand or a chore that they cannot do very well. “I didn’t do it” or “not me” is a common response when something goes awry. “Who spilled juice in the kitchen and didn’t clean it up?” is followed up by “Not Me!” Well guess what? Mom knows who spilled the juice, your child knows who spilled juice and now that they’ve lied about it instead of admitting their mistake, they’ve just dug themselves deeper into the lie and a chain reaction has started. The mistake, the lie and reaction to the lie. Consider your reactions in this scenario, how do you react when the juice is spilled, a mess isn’t cleaned up or something else they avoid admitting to? Do you yell, get angry, are frustrated or mad? Do you react rationally or irrationally? The next time a slip-up happens and your child doesn’t admit to their mistake, check your emotions to see what reactions you are exhibiting in front of your kids. Are your kids trying to hide the truth from you because they’re afraid of how you’ll react? 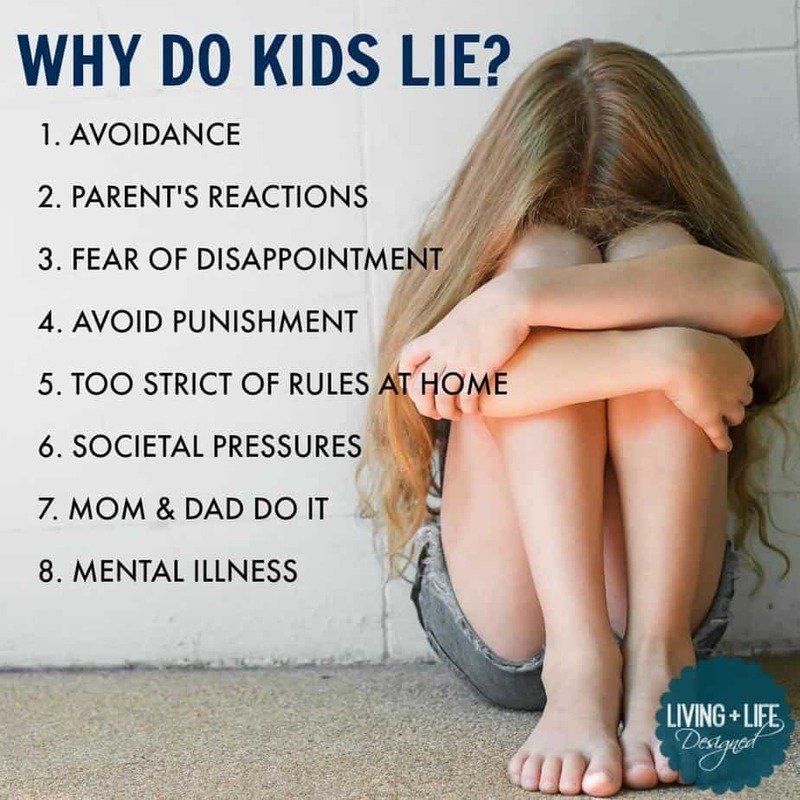 Lies that children tell may be to avoid getting in trouble with Mom and Dad because they’re afraid to disappoint you and the feelings of unworthiness it stirs deep inside. 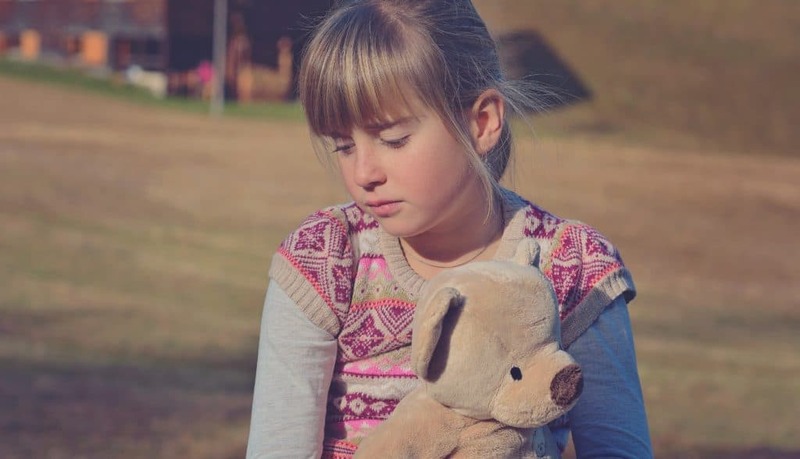 Before you punish your child with harsh words, elevated tone of voice or labeling your child for the mistake, take a moment to consider the reasons why they lied and wanted to hide the mistake from you. What are your expectations for your children? Do you expect straight As, perfect behavior and no back talk? If you’re expectations are too high, even in just some areas of your parenting, your children may have feelings of being unworthy, shamed and have low self-confidence. Hiding mistakes from you helps shield them from being hurt and feeling like they are disappointing you and doing a bad job once again. Learn to create a positive home where your children feel worthy and parents have a positive relationship with their kids. It’s not uncommon for kids to lie to avoid strict punishments and consequences at home. If they’ve had a minor infraction, they just might be lying to you because they’re afraid of your strong reaction such as yelling, belittling, stern consequences and even physical punishment such as spanking, or worse. What are the consequences in your home like? Do consequences match the misdemeanor or are they too harsh? If consequences, and your reaction, are out of line, too harsh, demeaning, or involves punitive punishment, it’s time to stop and reevaluate your parenting and the role of consequences in your relationship with your children. 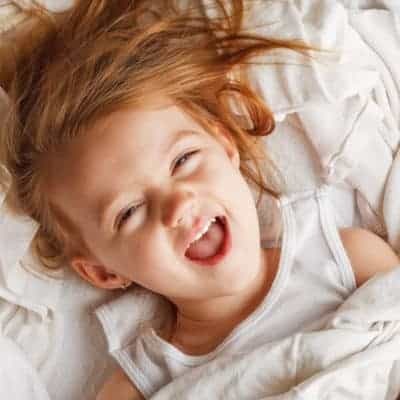 Children lie when the rules at home are too strict and don’t allow for them to have age-appropriate independence and freedom. The lies and made up stories they create will get them more of what they’re missing out on at home – freedom – because they feel confined and overly regulated. 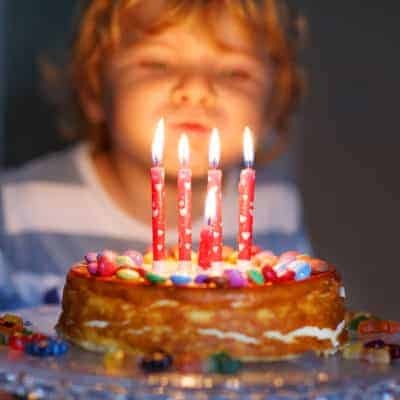 If you find a child lying to have more freedom, it could be time to loosen up the reigns and give them of what they need (in age appropriate amounts) so they won’t go behind your back to get it on their own. It might be time to assess your child’s confidence; are they trying too hard to fit in because they are lacking in self-confidence in their abilities and self-respect? Does your child need help learning how to make friends? We’re not talking about the Tooth Fairy, Santa Clause, and the Easter Bunny here… those are lies that spark magic in childhood whether you choose to involve them in your family or not. What we are talking about is setting an example for our kids. Those little “white lies” that Mom or Dad tell about shopping expenses, when someone asks you if you like their new pair of pants (and you don’t but tell them you do), or hiding an extra trip to Starbucks from your spouse are actually promoting the habit of lying. While we think that “white lies” don’t hurt anyone, kids see that their parents skew the truth, get away with it and no one is hurt from them, so you’re setting the precedent that lying is sometimes Ok.
Stop thinking that “white lies” are OK lies. No type of dishonesty is good and it doesn’t promote honesty to your children. When parents are dishonest with each other, your children will be dishonest with you as well. How can you expect honesty if you can’t give it 100% as well? It’s worth noting that lying can also be an early indication of the beginning of mental illness. Pathological lying is associated with other symptoms, and kids who lie as a reflex (versus manipulation) whether they see a practical need to or not (age-based) may require further medical evaluation. Understand that the magnitude of the lie(s) your children tell will be dependent on their growth, maturity, positive environment and honest communication with their parents that create the value of truthfulness.